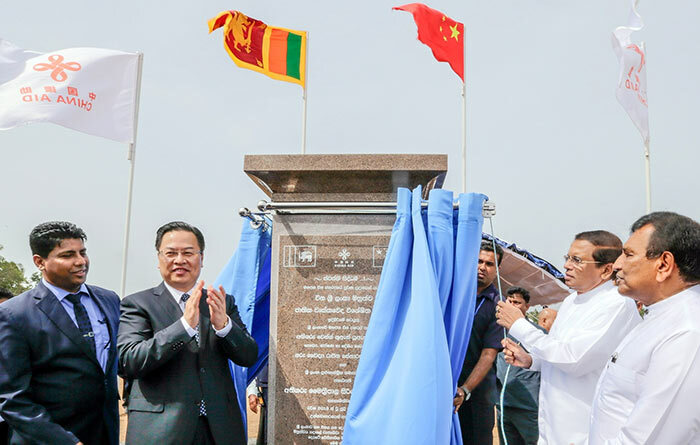 Sri Lankan President Maithripala Sirisena attended a groundbreaking ceremony on Saturday to launch the construction of a China-Sri Lanka friendship hospital in Polonnaruwa in north central Sri Lanka. The National Nephrology Specialist Hospital is being constructed following a request by President Sirisena to the Chinese government. The 25,517-square-meter hospital, which will be the largest kidney hospital in South Asia, will include 200 inpatient beds and 100 hemodialysis beds. The construction of the hospital is expected to be completed in two years. Speaking at the ceremony, President Sirisena said this hospital would not only benefit the people of Polonnaruwa, but would benefit the entire island country. He said with the assistance of China, this kidney hospital would have state-of-the-art facilities and would be one of the finest kidney hospitals in the region. Sirisena thanked the Chinese government for fulfilling his request and conducting the feasibility studies to build the hospital. Noting that China and Sri Lanka shared very strong ties, he said China had also contributed to Sri Lanka’s economic development. Health Minister Rajitha Senaratne said the hospital would include all the latest facilities to treat patients suffering from kidney diseases and it was being constructed in Polonnaruwa as it was the district which had the highest number of patients with chronic kidney diseases. Senaratne said to date officials were unable to detect the specific reasons leading to kidney diseases in this area and this hospital would be beneficial for these patients as it would also include facilities to conduct kidney dialysis. “Foreign patients who are suffering from kidney diseases can also seek treatment in this hospital once it is completed in 2020. We are thankful to the Chinese government for fulfilling the president’s request and constructing this hospital,” Senaratne said. Chinese Ambassador Cheng Xueyuan said Polonnaruwa, which was dubbed as ‘Asia’s capital,’ is a UNESCO World Heritage Center. He said the construction of this special hospital in Polonnaruwa would add more value to this city and the hospital itself would treat thousands of people suffering from chronic kidney disease. The China-Sri Lanka Friendship Nephrology Hospital will also include an Out Patients Treatment Department and six modern surgical theatres needed for kidney transplants. There will also be a 200-seat auditorium with a car park which can accommodate 300 vehicles.